Dive into the mysteries of ancient techniques to quiet the mind, gain clarity, cultivate inner balance and establish a deeper connection to yourself and others. ‘Sadhana’ means a spiritual practice. Bhakti Marga Sadhana, through the grace of spiritual Masters Paramahamsa Vishwananda and Mahavatar Babaji, opens the heart to the transformational power of love. Bhakti Marga offers one sadhana with five different ways to rise in love with life. While each practice comes from the same source, they are each unique in the way they pierce the darkness and illuminate the path to real happiness and true Love. Our techniques will help you still the mind and drop into the silence of the heart where love can blossom. Project Mantra is a free, guided program that helps you gradually build up an easy, yet powerful daily chanting practice over 40 days. 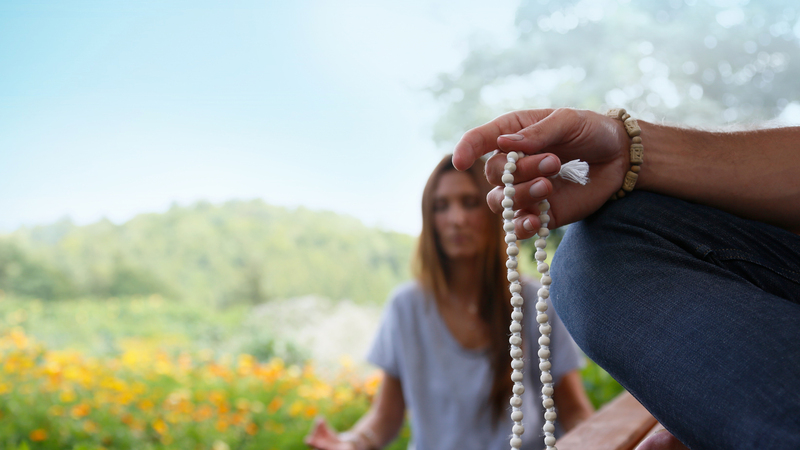 It is perfect for beginners who want a simple, effective tool to quiet the mind, open the heart, and create a positive habit of connecting with the Divine on a daily basis. Simply Meditation is an easy set of techniques to help calm the mind, cultivate inner balance and allow you to experience more love in your life and relationships. The simple practice can create a peaceful state of mind in as little as 5-15 minutes per day, and support your physical, mental and emotional well-being. It is perfect for those new to meditation or stressed by daily life. OM Chanting is a free group practice that uses the transformational power of OM to activate the self-healing potential of participants. The practice transforms negativity into positive energy, helps purify the local environment, and supports the physical, emotional and spiritual well-being of participants. Atma Kriya Yoga helps you realise a personal relationship with the Divine by bringing the awareness of the soul into everything you do. Through the grace of Shaktipat Initiation, the practice brings you more love, joy and connection with life itself. It also helps burn lifetimes of karma, and purify the mind and body so you can advance on your spiritual path. Sadhana helps you control the mind. When you do it with love, you will not be disturbed by anything that is around you. Ready to dive deeper into the wisdom source?